Looking for an awesome potato recipe? 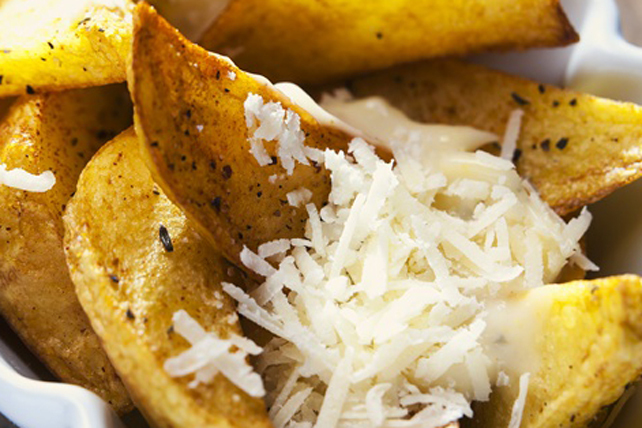 Then, try our recipe for Potato Wedges with Garlic and Parmesan. It's a recipe that's sure to be a hit! Toss potatoes with Italian dressing in large bowl; spread onto parchment-covered rimmed baking sheet. Bake 40 to 45 min. or until potatoes are tender, turning after 30 min. Meanwhile, mix Miracle Whip and garlic until blended. Place potatoes in large bowl; top with Miracle Whip mixture and cheese. Prepare using Kraft 100% Romano Shredded Cheese or Kraft Parmesan, Romano & Asiago Shredded Cheese.